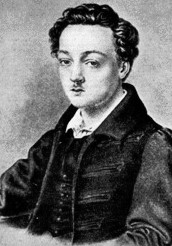 Karl Georg Büchner (17 October 1813 – 19 February 1837) was a German dramatist and writer of poetry and prose, considered part of the Young Germany movement. He was also a revolutionary and the brother of physician and philosopher Ludwig Büchner. His literary achievements, though few in number, are generally held in great esteem in Germany and it is widely believed that, had it not been for his early death, he might have joined such central German literary figures as Johann Wolfgang von Goethe and Friedrich Schiller at the summit of their profession.